If we would see an icefree arctic in a few years, what do you think how much volume first year ice could be generate in one winter season? 10000, 15000 ? I liked the idea of a slow transition when I first read it. But is there really any evidence--as of yet---that this slow transition - a slowdown in the steady decline of the winter volume max - is happening? S.Pansa - You have misunderstood the slow transition. It simply means don't expect a tipping point or acceleration in melt. It does not mean a slowdown in the decline. Crandles - I agree. Nowhere does the slow transition infer that FDDs are unchanged going forward. Even this winter we still see DMI N80 FDDs indicating a thickness growth of between 1 and 1.5m. I don't think it depends too much on the icefree part, as it does on how much open water for how long. If this year gets more open water than last year and for a longer time, more heat will be stored in the water. Also, how many clear days will the Arctic have this year? The last freezing season was a practical wreck from the heat stored in the water. At this point, the coming freezing season and final volume(made up of mostly FYI) cannot help but to reflect what will happen this summer. That might very well be the case (as usual, I should add ). Since the volume loss of 2010 the volume of the Arctic Ocean has levelled at around 19.3k km^3, the same volume as calculated to be the rough volume to be expected with a mainly first year ice pack. I do not think this is coincidental. All this means I expect to see an end to the previous volume loss trend because this was mainly due to loss of multi year ice (MYI). MYI is now going to fluctuate at low levels in the years to come. Volume and MYI may be up at the end of this season, but it remains fluctuation at a low level compared to the past. By next April I expect to see a volume figure similar to the last four volumes of the series shown above. The end to the period of rapid loss of volume may already have happened, but the time period involved since 2010 is far to short given the variability in the data for statistical significance. "Melt season losses and April volume converge around 2020 assuming that April volume continues to drop. ... If I hold April volume level from recent years then the two lines converge in the late 2020s"
*)Important caveat: Chris Reynolds explicitly refers to the volume in the Central Arctic and not the entire one as I have done in my post above. the "slow transition" theory postulated that summer sea ice in the arctic will slowly transition to a seasonally ice-free state instead of a tipping point and immediate collapse - this due to a plateau in winter sea ice after the MYI has largely gone and thanks to almost-constant FDDs. I think the summer period volume estimates may not fully incorporate the fact that the nearer one goes to the pole in the summer, the circular reach of sunshine prevents permanent and semi-permanent shadows that keep ice cold preserve it longer. In June the north coasts of Greenland and Ellesmere (often cited as the last "sea ice refugia" for the last 1,000,000 km2 where sea ice would survive) to produce a plateau in melting or be linear gradual phase out tail. In summer volume, I think it is rubbish this idea of 1m km2 of "sheltered ice"(!) Even though, there are mountains in Greenland / Ellesmere, the sun still shines in these areas at 17 degrees high - creating rather limited 'shadow-refugia' by topographic silhouette (whatever it may be). The (wrong) idea by juxtaposing the corner of the south-west Ohotks Sea sea ice refugia is a wrong comparison as that site locates so far in the south. The same applies to the little more northern west-of-Kamchatka Peninsula sea ice refugia, sheltered from the morning sun and easterly winds by the shadows of mountains in the east over the Kamsatkan silhouette. During the night, the sun is here also beyond the horizon. But, nay, north of Ellesmere and Greenland, the sun is just about everywhere to warm the ice 24 hours (as long as there aren't clouds to mask it, and any deep sided narrow fjord excluded). When it comes to the winter-time ice, the most important overlooked consideration for the 'cold sink' of the Arctic is the transmission of residual heat elsewhere (from the mid-latitudes) as in the Far North itself the sun is just missing totally. As the surface area of the globe between 80 and 90 degrees is many, many times smaller than that between 0 and 10 degrees at the Equator, all I can think of, is that the tiny caps will respond (fill up their reservoirs of cold air by heat) will happen really quickly in the end that will surprise many. In Antarctica this process will eventually be even faster than one in the north as the free airspace over Antarctica's ice does not have mass like the Arctic polar air mass has (as the air column extends right down to the sea level and also interacts with surface waters of ocean). Land ice in Antarctic is more insular than sea ice / sea water, so despite the massively bigger thermal inertia within its ice domes, the thermal inertia of air over Antarctica is much smaller. The land sitting ice there remains much more inaccessible for exchanging heat than on the North Pole as ice there cannot mix heat much vertically like ocean (although moulins and crevasses mop up water and heat once melting starts there properly). Any variation in the anticipated winter-time retention of sun's heat is one contributor determining how much sea ice volume survives the winter, the sea ice breaking and vertical mixing and moisture (fog, low-lying clouds) will determine how much ice volume is left. The winter darkness on the poles is fixed and predictable, winter is winter always there! So, the transportation of heat in, colness out, sea ice breakage and mixing into sea water determine that there will be a quick flop at the very end of polar sea icecalypse. The global sea ice volume would be influenced in Antarctica by meltwater and ice run-off changing sea water temperature and salinity. He would be right, if only account for temperature, thinner and younger ice is able to grow faster by not so cold air, if condition stay stabile this would mean, that there is a end line for thinning in winter. The Problem is, its not just temperature, if moisture also increase, means more snow on ice, since snow is also good insolator, the thicking would be reduced. Attached is what I call annual volume gain. It is just this year maximum volume minus last year minimum volume. The 2017 point is up to day 90, so unless max volume was reached on day 90 (very unlikely) it will grow a bit more until maximum volume. The record growth was 19.659 in 2013. So if the Freezing season started at 0 ice volume, but by some miracle with no waves, the same salinity, the same air temperature the same sea temperature, the freezing time etc., the maximum volume will reach around 19.659, at least according to the record. Of course an ice free arctic will be saltier, wavier, warmer and who know what the atmospheric currents will be up to. If it doesn't decide to float south...in chunks. So when we look to future, the gains of winter ice volume could rise further until the "meltout" in summer/autumn 20XX. From this point its unlikely for record gains in winter. Is this a possible szenario? Let's imagine a future melt season that has enough energy to melt 1,000 km3 more ice than is present at the start of the season. It seems like we might get there within a few years. Do I have this math right? The amount of energy required to melt 1,000 km3 can raise the temperature of 80,000 km3 by 1 deg C. 80,000 km3 is 80,000,000 km2 by 1 meter deep. If we assume there is about 15,000,000 km2 of "ice covered area" in the arctic at the start of melt season, this means that the excess heat could warm this entire area 1 meter deep by about 5 deg C! (80,000,000/15,000,000=5.33). I feel like there must be an order of magnitude error in here somewhere as that seems extreme for what at this point feels like a rather likely change in the energy balance of arctic. I guess if this amount of heat gets mixed into the water column 10s or even 100s of meters deep, it "only" represents a few 10ths to 100ths of a deg. You are not far off. Th oceanic mixed layer is between 25 and 250 meters. But neither do I see any slowdown. What am I missing? Perhaps that the piecewise linear fit is a better fit? S. Pansa thank you for putting these quotes here. You have said what I was trying to say, in a far better and clearer way. I think Chris R's theory was very important, a must-read even, and equally important is its failure (at least this year). Chris basically expected a memory-less arctic of FYI, thereby immune from tipping points. One summer of total meltout would still result in good FYI cover and quite possibly next summer would not melt out again. But my fear is that the arctic does retain a significant memory of a meltout summer (via higher surface salinity? top layer retained heat? humidity evaporating from open water? storminess? etc.) and therefore might prevent good growth of winter volume, highly increasing chances of next summer meltout and so leading to a very fast transition to a seasonally ice-free arctic. Yes 2017 warm winter and yes that seems possible if not likely or virtually certain. Less sure about how quickly the freeze volume will shrink once we reach zero ice in summer, but I would certainly expect a downward trend from then on. I also saw this in our discussions about the Tische et al (2012) paper that postulated a stronger than average ice recovery after an effective ice free state due to increased longwave emissions from the ocean. I was always suspect of this since 1. we have strong paleoclimate indication of rapid shifts to equable (or near-equable) arctic regimes during the Pliocene that indicate cold but moist conditions that are strong thermal blankets to longwave emissions and 2. that the increased cooling effect of aerosols was going to have to end sooner or later (it seems sooner than later) and this would effectively produce a rapid shift into a new climate regime in the arctic. however, I did not suspect that there would be such a rapid increase of mid-latitude water vapor from the tropics to mid-latitudes and then into the arctic subsequent to China reducing their high-temperature SO2 emissions. I did know that tropopause height (water vapor and lapse rate) feedbacks were not included in the GCMs and that this was going to change things. but I thought it would be primarily a localized effect (mostly ENSO). I should have known better after watching the 'black swan' recovery event of the 2013/2014 season with the anomalously strong negative Pacific North American circulation index, feeding summer clouds, cooling and heavy snows in the late spring early summer into the arctic circle. As ling as there is ice, as long there is a surface layer with reduced salinity and reduced temperature. Even 2012 these effects were prominent. But this helps refreezing. Thin ice looses more energy by conduction and subsequent radiation, than thick ice. Still the faster refreezing does not push back the ice volume to ancient heights, but it is an effect slowing the arctic breakdown. An arctic ocean with more water and this for a longer time than 2012 may change the game. Significantly warmer water, saltier. It will radiate off, but moist air - self generated - will slow that. Refreezing volumes will then be lowered. Another blast comes from the global warming, as Mitchell wrote. Much warmer ans moister air is transported to the arctic core these years. Obviously limiting refreezing 2017. An effect which is here to stay (albeit weather will do fluctuations each freezing season). You are definitely better with numbers but my first question would be. Is the green trend (Trend 4 from 2011 to 2016 I suppose) significant, robust? My uneducated guess would be: no. If I add just another datapoint - completely unscientifically an estimate for the 2017 Max of around 21.000 km³ - the trend suddenly points down- and not upwards (see first image, neither of the trends shown there seem to be significant, says my eyeball-test). Anyways. What I missed upthread was the fact that Chris Reynolds was talking about a plateau in the April Volume of the Arctic Ocean proper. Best exemplified with the second image from here. However there is a reason to suspect that we may be near a change in the trend of loss for April volume in the Central Arctic. April thickness for Beaufort, Chukchi and East Siberian Seas has been around an average of 2.2m thick since the 2007 record melt year. If we take this as typical thickness of first year ice in April, and assume that this will be the typical thickness of the Central Arctic region within a few years (thickness was around 2.3m in April 2013), then with the Central region having an area of 4.43M km^2, such a thickness implies a volume of 9740.8km^3. 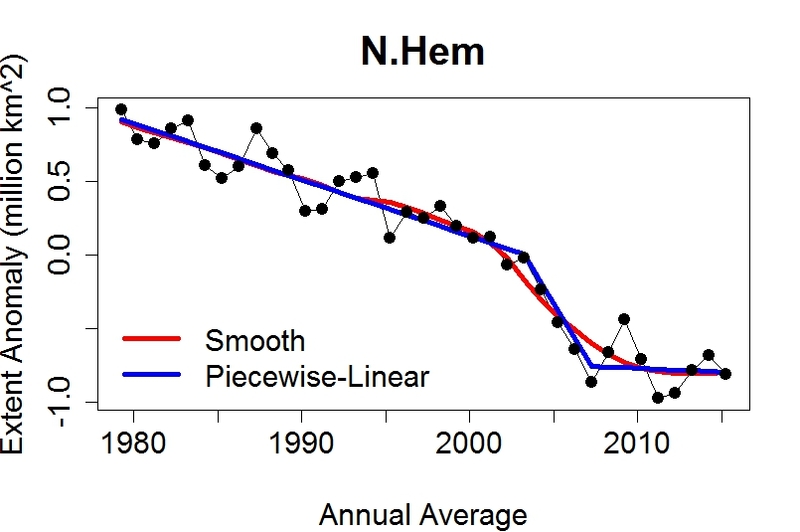 So if the annual range of loss kept increasing and the volume losses in the central Arctic would level within the next few years, then the intersection of melt season losses and April volume would be moved forward to around 2030. The end to the period of rapid loss of volume may already have happened, but the time period involved since 2010 is far to short given the variability in the data for statistical significance. Has the trend of the April Arctic Ocean Volume max (AAOVm - what a stupid acronym ) changed since then? Is it still flat or will we now, in 2017, be closer to the average volume melt of the Central Arctic (around 6.000 km³)? The third image below shows the estimated trend for the period 2010-2017 - unfortunately only for the entire Arctic (and with a 2017 Max guessed at 21.000 km³). Another question: What role does the thickness distribution play here - especially this year, as so much ice is piled up near the Fram? Perhaps Seaicesailor (or anybody else who is able to process the data) can help us out with recent Volume data for the Central Arctic? PS: @ Oren - Well it was actually your summary of the Slow transition that made me realize that the plateau in winter volume is an important part of it. And agreed on the must-read. I have learned a lot by just rereading parts of it. What's really worrying is that they include recent years (mostly low volume years) in their 'mean volume 1979-2016'. That means the black line will be getting lower each year, as recent years are added to the mean. If they just used 1979-2000 (as Climate-Reanalyser does for temperatures), then the black line would be much higher up the chart (not that that period alone would be enough to show average though). What do the ice cores, taken from at least the 1970s, show, about the longer-term past of the Arctic? Yes I should have said I put that together quickly guessing the change points and haven't done any testing of whether the trends are statistically significantly different. A lot more work would be needed to check this and what the correct change points are. so for extent the different trends are statistically significantly different. I don't believe the green trend should be upward so there must be a lot of uncertainty about the trend rate. The extent numbers are generally noisier than the volume numbers so if there are statistically different trends in the extent numbers it would seem to follow that the volume numbers probably have statistically significant trends. OTOH 2003 to 2007 is only 5 years data and looks surprisingly in a straight line so perhaps that is just a fluke that happened to reach statistical significance. Tamino knows this stuff far far better than I do so maybe I shouldn't cast doubt on what he finds. Interesting further questions. I'll let someone else have a go. Thank you very much for the link! Unfortunately this goes way above my head - so I have to leave this to someone else. One last comment on the possible volume plateau in the Central Arctic & the Arctic Ocean. I downloaded the Regional Piomas Data from Dosbat. The data stopped updating in 09/2016, hence 2017 is missing. But between 2010 and 2016, neither the April Volume in the Arctic Ocean (the blue line in the first attached image is without the CAA, the Barents+ Greenland Sea) nor that in the Central Arctic show any downward trend. That would confirm a plateau (even though these trends are not significant as far as I can tell). The million dollar question remains though: Has this changed in 2017? My gut-feeling-guess is yes (but maybe an outlier?). Sadly I am unable to produce the regional data to confirm it (& April data is still missing). So I'll have to leave this to others. On the other hand, we will find out soon enough in the real world. Thus: A happy melting season to us all. May it scare the hell out of us---finally! There is no statistical significance to the short term noise in the regional volume calculations. Don't call those "lines" trends. This winter's many Arctic cyclones and record heat have redistributed the ice volume and diminished it. 2017 is very different from 2013 to 2016. In this post he discusses the details. A current version of Chris's graph for the entire Arctic ice volume with the trends extrapolated out until the Arctic is 'Ice free' predicts that unhappy event will occur within a very few years. This years figures can only make the situation worse! When looking at the extent and volume figures for the past few years it is worth considering the effect global and arctic temperatures have on the variations. As the graph shows, 2005 - 2007 and 2010-2012 were exceptionally warm in the Arctic, corresponding to the higher than average melt years. 2016 moved up a whole new level of warmth. So far 2017 is tracking much closer to 2017 than any previous year with the ESRL data showing March as hottest on record in the Arctic. It is also worth observing that according to GISS Arctic temperatures are rising 3.3 times faster than global temperatures and for both data sets the rate of increase is increasing. Yes, thanks Bill, that's great info. Chris's point was that extrapolation of the top graph is wrong, and it should plateau with only a slight downward trend. But this years' data is expected to break the plateau, hence the significance. I don't feel as if you can take a single year drop below this apparent flattening of volume seen over the past 6 years as evidence of "breaking the plateau". And while we cannot be certain this apparent flattening in the volume metric is real, it will take far more than 1 year of even a dramatic dip below this flattening to suggest that it is not. A one year dip is just another data point in the random walk around a new average year end volume that is possibly emerging. We will know more over the next several years and I will be looking for a run of annual data points that are all consistently lower than the flattened run preceding it. Eyeballing SIA and SIE min and max trends, there appears to be a similar flattening that has emerged a little earlier than volume (more pronounced on the minimums). When these plateaus in SIE and SIA occurred, we see a noticeable jump in BICOT, a measure of the spread between the annual min and max. Can these trends in each of these metrics be related, capturing a shift in Arctic climatology? And if so, what are the reasons? Another related chart that shows a jump in seasonal melt for both SIE and SIA that occurred just as the minimum and maximum plateaus for SIE and SIA emerged. I've set the Y axis grid so as to make this jump and subsequent plateau more obvious. All of these charts can be found on the slow transition thread and I apologize for posting them here as it is taking us off topic. When you have multiple metrics capturing a shift such as these charts do, I can only conclude that something has happened, beginning in 2007 and each of these metrics are telling us this. It does appear to be volume related as 2007 was a devastating melt season, destroying a lot of MYI. One last chart that shows a dramatic jump in sea ice dispersion at minimum that occurred at the same time. I do believe that all of these charts I have posted suggest that Chris is on to something and it is volume related. I will point out that Chris has always maintained that volume was the metric to watch, even as we all gazed, transfixed by SIE behavior. What happened in 2007 was that the 3 year average arctic temperature jumped almost half a degree above the previous record. There were then a couple of cooler years followed by very high temperatures from 2010-2012 producing a new record average in 2012. In 2013 temps dropped to the lowest level since 2004 and they have been creeping back up since then. 2013 - 2014 was the coolest three year period since 2002 - 04. 2014 -2016 was the hottest on record. If you look at the gains and losses in volume, area and extent they broadly follow this pattern. Indicating that arctic temperatures are a primary driving force for losses. 2017 promises to be nearly as hot as 2016 both globally and in the Arctic and I expect the result to be exceptional lows in volume and extent this year. Measuring Arctic sea ice volume and extent trends from 2007 or 2010 is as fallacious as measuring global temperatures from 1998. Yes, this is sensible statistics. It assumes - as our base case should for the time being - that there is no fundamental change in the ice regime. That said, I am uneasy about Neven's observation in the ASIB post that "things haven't gotten worse" in the past month. The volume anomaly is extremely low, "which is exceptional for this time of year" as he pointed out, and not exhibiting any near-term regression toward the mean. The marble may still be near the rim of the bowl. Just a quick one. 2017 has build a big lead over 2012 in the race for the lowest annual minimum (Arctic Sea Ice) volume. The graph shows that most of the lead was gained in the freezing season: end-October/begin-November, followed by a smaller spurt in December. The bump in February, followed by the slow decrease in March may or may not be regarded as "noise". No regression toward the mean indeed. Bloody hell, that's a scary graph if ever I saw one. I took the liberty of adding a few blue pixels to one of Wipneus' excellent charts. The +/-1 sigma confidence range for 2017 clearly indicates the possibility of a record minimum yearly Arctic sea ice volume, and the fact that we are as of end March / beginning April 2017 around 2,500km3 below 2012 reinforces this and confirms the exponential trend. The +/- 1 sigma confidence interval also indicates essentially zero Arctic sea ice volume reached between September 2020 and September 2024. This is slightly earlier than Chris Reynolds's forecast of essentially zero Arctic sea ice volume by the mid-20's. The big difference between Chris Reynolds' "slow transition" scenario and the 2017 situation is that whereas Chris was positing that April sea ice volume would slowly and linearly decline, in 2017 April sea ice volume is likely to be a record low, with a large step down from previous values. I would expect similar charts with similar trendlines for August and October would suggest a continuous, essentially sea ice free Arctic state would be reached for the months of August-September-October no later than 2035, in other words, 18 years from now. How this will affect the global climate system is anyone's guess, but there are bound to be serious consequences. Meanwhile, the arctic volume graph from "arctischepinguin" shows a significant increase in volume from end March to early April of just about 2,000 km3, just nudging the 22,000 km3 mark. But what will happen in the last 17 days of April, especially given temperatures in the Arctic generally and above 80N showing fairly strong positive anomalies at the moment. Only the 14th April and I'm already in PIOMAS cold turkey. and confirms the exponential trend. How many fails are needed before you decide gompertz is better trend than exponential? I think 2017 will be exceptionally low but is this an outlier due to FDD outlier or has FDD stepped down or new trend or ... ? Anyway, one potentially outlier year shouldn't be seen as confirming a trend that has been doing badly over the last several years. The choice of Gompertz over exponential depends on whether you believe negative feedbacks overwhelm positive feedbacks as we approach a sea ice free state in the Arctic. I happen to believe that there are much stronger positive feedbacks than negative feedbacks that affect Arctic sea ice volume, so the exponential trend makes more sense to me. Mathematically in terms of "best fit" both trends are more or less equivalent. And at this stage both trends show the Arctic going essentially sea ice free within a few years difference. So suit yourself and choose whatever trendline you like best. As I wrote in another thread, the words you choose to describe the unfolding Arctic sea ice (and global climate) catastrophe(s) change not one bit of the reality. Thats the problem, science have nothing to do with it, you should better go in church or change your mind from belive to what you can say in confidence. Sure I could waste my time and make a list of positive feedbacks that accelerate (hence the exponential decline) the decline of Arctic sea ice, and try to quantify them, and compare them to another much shorter list of lesser significant negative feedbacks (that would slow down the decline of Arctic sea ice), just to try and demonstrate to you that the exponential trendline is a "better" fit to the data than the Gompertz one. But I don't have to. Because as I wrote before, for all I care, you can suit yourself and use whatever trendline you like or believe is "best fitting". Your advice that I "better go in church" is completely out of place, btw, and that too, you can keep to yourself. So suit yourself and choose whatever trendline you like best. As I wrote in another thread, the words you choose to describe the unfolding Arctic sea ice (and global climate) catastrophe(s) changes not one bit of the reality. Funny that use a model that suits your preconceived conclusion (zero volume), given one of the arguments you use to discredit that paper over the other thread (to use a model that suits a preconceived conclusion). But well we are not scientists. Are we? No list, just physical explanations, just fitting is just only fitting and its fitting always the past and say nothing about the future. In fact, if you dont know when and how much a feedback is, you can eastimate from past nothing into future. So i have my own model, its based on observations with physical linked variables, it just need only 30% of all Data in the past, to forecast September SIE, does you fit working well just with 30% of past? 1. You are confusing a climate model with a simple trendline fit. That they are completely different mathematical tools is an obvious fact that seems to have escaped you. 2. I am not the author of the charts with the trendlines above. Wipneus is. That the trendline crosses the X axis at some point in the near future is not a "preconceived conclusion", it's a mathematical evidence, as in 2+2=4. 3. You are distorting what I wrote "over the other thread". Again, a scientist should use whatever instrument/tool allows her/him to gather the best possible data. And models are an essential tool for scientists, not only in climate science, but in many other areas. I already countered this distortion of what I wrote "over the other thread", so please refer to my comments there for the details, as I can't be bothered with repeating myself here (yet again). ... just fitting is just only fitting and its fitting always the past and say nothing about the future. Of course trendlines are calculated/plotted to fit past data, because we don't have future data, do we? And of course they say something about the future: they say what you can expect with a given level of confidence. This is all basic statistics, so I suggest you go and read a book. And again, just to be clear: the choice of exponential, Gompertz or linear trendline depends on the precise phenomenon that you are trying to describe, it's a technical choice, not aesthetic or because of personal preferences, and even less because of a "preconceived conclusion". And as DrTskoul suggested, let's get back on topic. Jaxa sea ice thickness image still shows a tiny bit of sea ice tucked into a corner of the Baltic. It has been there for some time. The less ice there is the less ice is melted. Hence my totally non-scientific preference for the Gompertz curve (the S curve to us non-scientist wallahs). (Also found in so many other places - building construction, extinction of species ......). Okay, unless someone has a remark to make about PIOMAS at the end of March, I would kindly suggest you find a more appropriate thread for this discussion (there are several).